Yesterday, I looked at Thor, God of Thunder! How about a look at his dad? 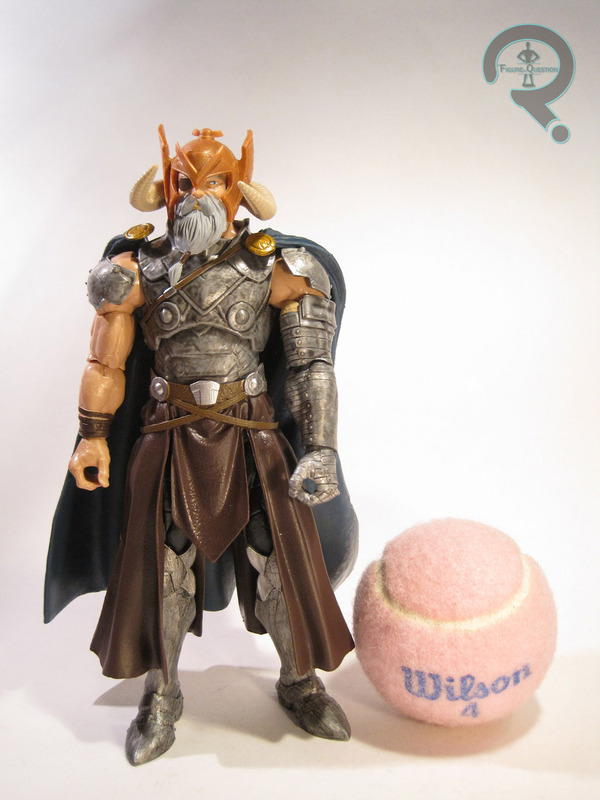 As luck would have it, Odin happens to be the Build-A-Figure of the very series that Thor was a part of! Isn’t that convenient? Or perhaps just proper planning on Hasbro’s part. I guess it could be that. If you wanna be all practical and stuff. So, let’s have a look at the Allfather, shall we? 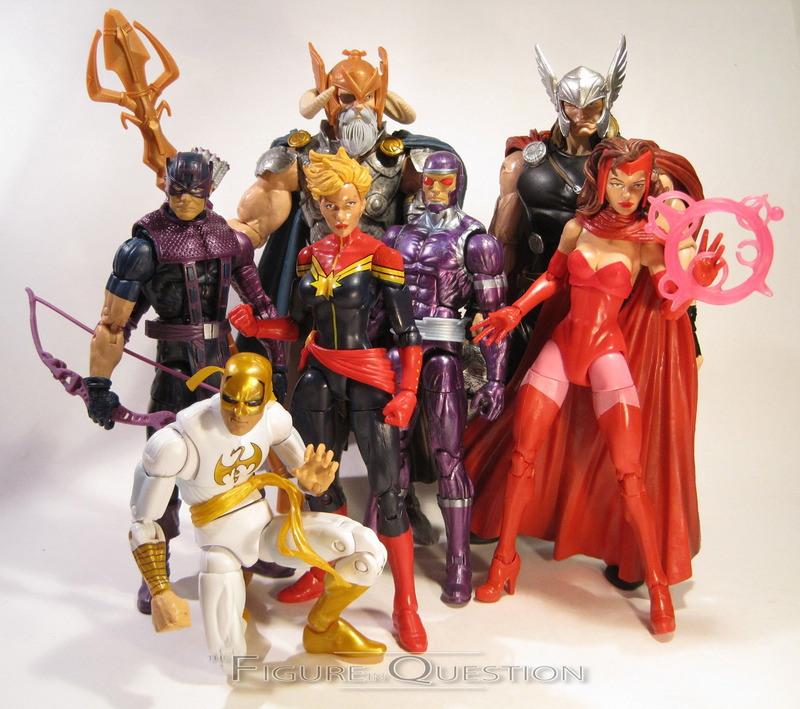 Odin is the Build-A-Figure for the first series of Avengers Marvel Legends Infinite Series figures. Technically, he doubles as both Odin and Future Thor, but the series is dubbed the “Odin” series, so I’m going to refer to him as Odin, and include the Future Thor parts as accessories (for the most part, anyway). 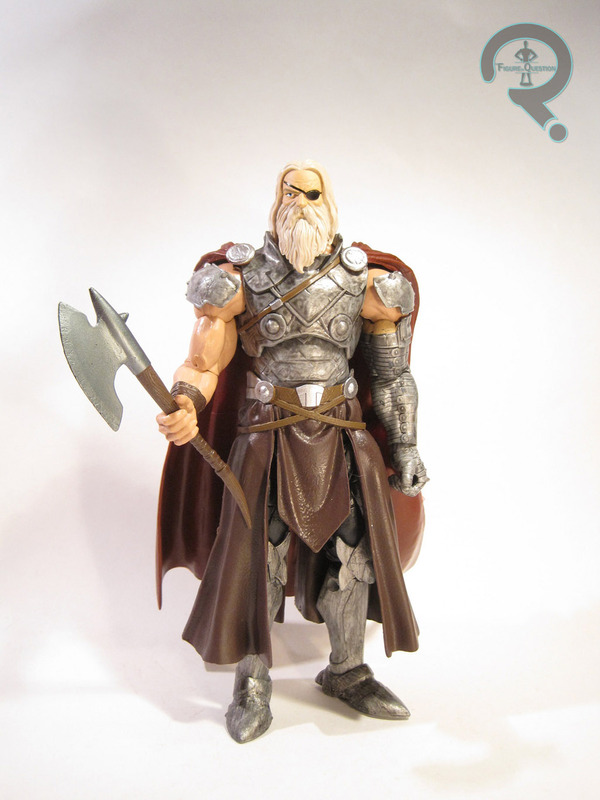 Odin is about the same size as Thor (fitting), clocking in at about 7 inches tall, and he has 30 points of articulation. I don’t actually know which particular Odin this is based on, or if it’s a particular Odin at all. I think they’ve actually used the Future Thor design as a starting point and just made it work for Odin, which, when you’re dealing with a character who doesn’t really have a definitive look, like Odin, isn’t a bad move. The look is mostly armored and has an appropriately regal look to it. The sculpt is fairlyt detailed, with a lot of texture work and such. Also, you’ll note that the left arm is armored, while the right is not. This actually isn’t completely accurate for Odin, as the left arm is meant to be Future Thor’s Destroyer arm, which replaced his missing arm. However, the regular Odin arms were packed with Sentry, and I didn’t really want to get him, so I settled for the Thor arms. Plus, the armored arm is a little cooler anyway. As a build-a-figure, the figure works pretty decently. He snaps together pretty easily and, aside from his legs popping off from time to time, he stays together pretty well. Odin’s paintwork is generally pretty clean, and it has some decent weathering to help ring out the sculpt’s details. The blue cape is definitely a cool touch, and it nicely separates him from Thor. It would be a little better if there were a some more gold on the actual body armor. As it stands, it’s entirely confined to his helmet, which looks just a bit jarring. Also, some gold on the body might make the figure a little brighter; it’s just a little on the drab side. Odin includes his trusty spear Gungnir (which never gets the credit it deserves!) as well as a spare head and cape for Future Thor, as well as Future Thor’s axe Jarnbjorn. I think this may be the first Build-A-Figure to actually get an accessory compliment. Let’s hope that idea sticks around! So, Odin is the Build-A-Figure that resulted from my getting all of the figures in this series. I actually kind of wanted to finish him. I’m not the world’s biggest Odin fan or anything, but he’s certainly a fixture in the Marvel Universe. He also makes for a pretty neat figure, drab color choices aside. Odin’s one of the few B-A-F’s I’ve finished of late, and I think a lot of that has to do with the fact that not only is he a pretty solid figure, but also none of the figures required to build him were the dud’s that we’ve inevitable come to expect from the B-A-F model. I’m glad to see Hasbro applying equal effort to all of the figures in the series! I’m not much of a Marvel collector but I do pick up the occasional Legends figure. I’m digging that Scarlett Witch but I\m really wondering how this guy would look alongside Masters of the Universe Classics figures? He seems like he’d make a great King Miro for that line! Thanks! 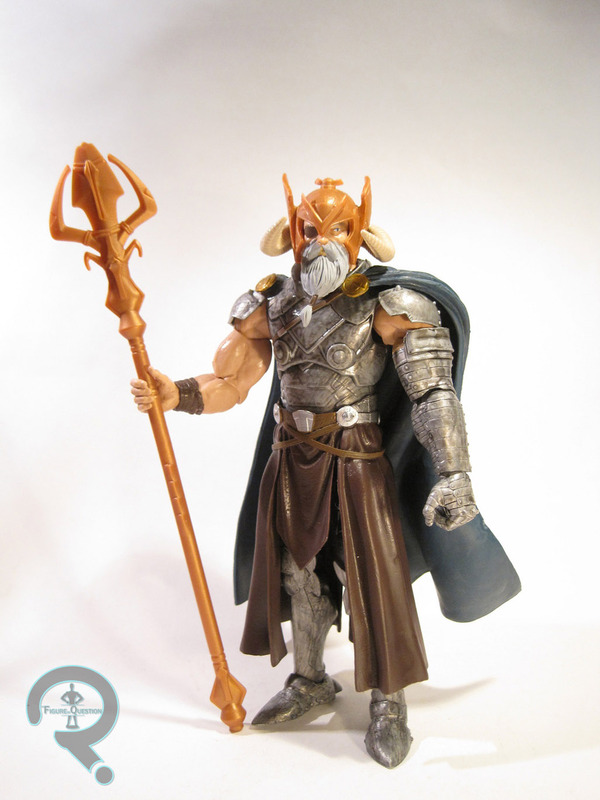 Odin is just a little taller than the average MotUC figure, but he meshes really well with the few that I have. I think he’d be a great Miro stand-in.